Artisan Bread Made Easy with No Kneading! I love bread. It’s one food I’ll never forgo. I love to make bread too. It is therapeutic for me to mix and knead the dough and there is absolutely nothing like the smell of bread, baking in the oven, to make your mouth water. You will find an earlier post of bread recipes and bread making directions, but I thought this time I would share another style of bread making: Artisan bread making. My brother and sister-in-law gave me a book titled Artisan Bread in Five Minutes a Day, by Hertzberg and Francois, 2007. I love this book because it has helped me make hundreds of beautiful gourmet loaves of bread with limited ingredients, time, and money. Imagine yourself serving your family warm, fresh-made bread every day or perhaps for special dinner guests. It’s easy to accomplish in minutes and everyone will think you spent hours slaving to make a gourmet item just for them! You will need two items in order to make the most of the artisan bread making experience: a one gallon food grade plastic bucket with lid and a bread stone. I was reluctant to make the stone purchase because of it’s price, but you won’t get good results unless you use one! The bread will be dense like a brick when made on a metal tray. The ingredients are as simple as the equipment to make a basic white bread recipe: all-purpose flour, water, yeast, and salt. 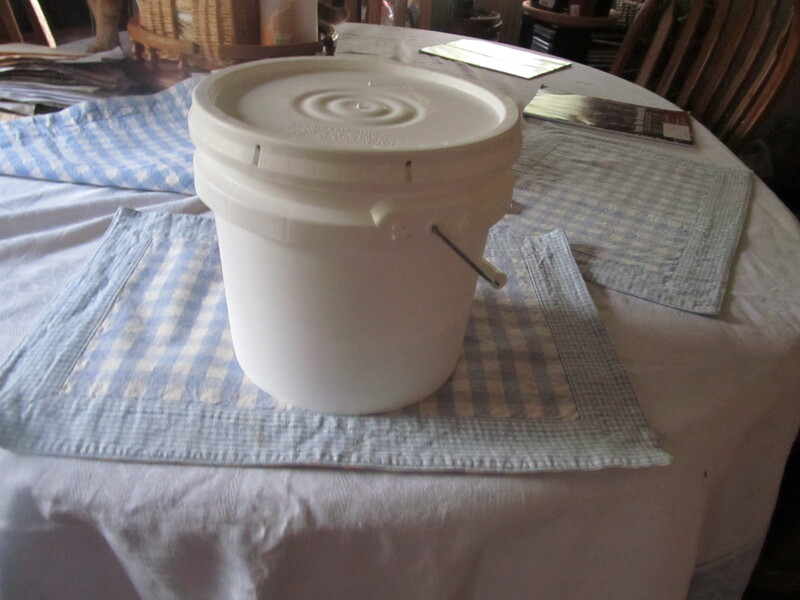 This one gallon food grade plastic bucket with lid works perfectly to mix and store the dough in the refrigerator until ready to bake. I bought the rectangle bread stone and it fits perfectly in my oven on the middle rack. Notice I have a second rack just below....this is where I place a cake pan full of water to add humidity during baking. First you pour water into the bucket and then add the yeast. Stir until yeast dissolves and let set for 5 minutes before adding the salt and flour. 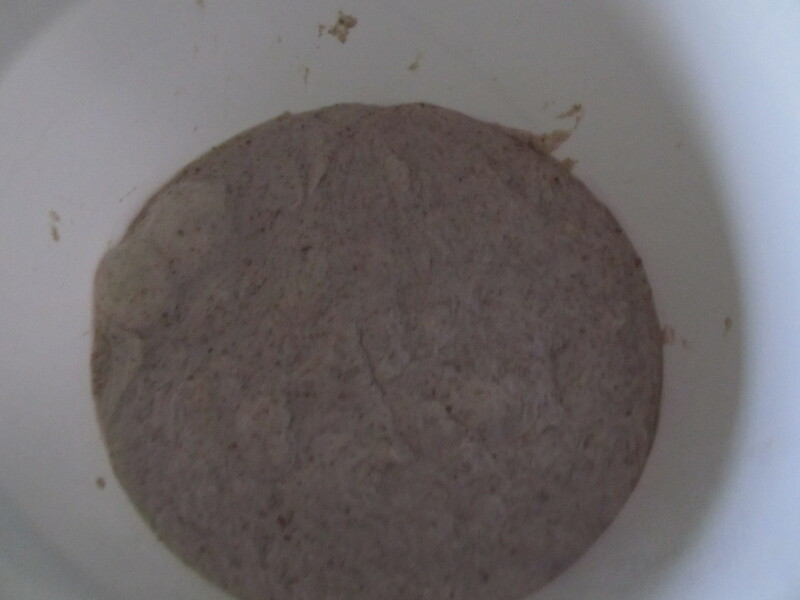 (Gives the yeast a chance to “awaken” ) To measure the flour accurately, scoop flour into 1 cup container and then scrape the top with a knife to remove excess flour. Mix until all dry ingredients are incorporated into a soft dough. Let the dough sit on the counter with lid on the bucket until it begins to flatten on top (approximately 2 hours, but longer if using cold water or cold temp in room) Notice, you do not knead this dough. This dough has been resting in the refrigerator for one week. 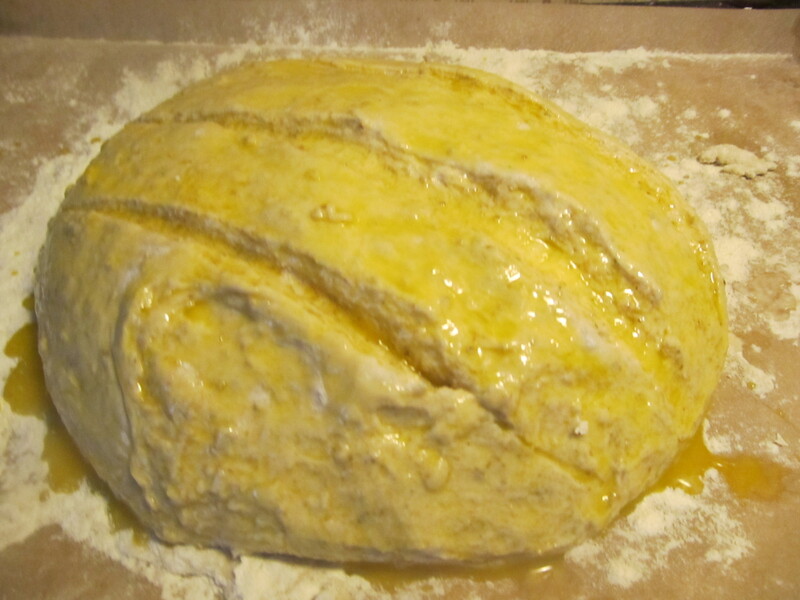 Just remove desired amount with floured hands and shape into a dough ball by pulling the sides down and under the loaf until a smooth surface is achieved. This dough has been shaped, cut with a serrated knife, and brushed with an egg wash. It will raise for about 15 minutes before being put into the oven on the stone surface. Just use the parchment paper to transfer easily! Dough may be used when finished rising or place the bucket with lid in the refrigerator to keep for up to 10 days. To bake, scoop about 1/4 of the dough out with your hands and sprinkle a bit of flour on top. Gently pull the sides down and under the loaf adding sprinkles of flour as needed until a smooth surface dough ball is achieved. 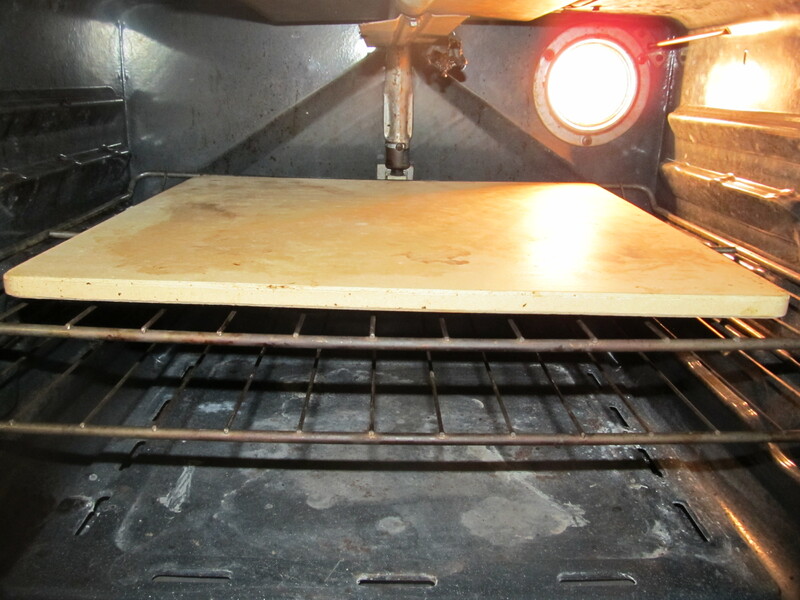 Place the dough on a baking sheet with no edge on one side, on top of a piece of parchment paper. With a serrated knife, cut slits in the top as desired. Next mix one egg with a bit of water and then brush the egg wash onto the surface of the bread. This will give a nice brown crusty finish to the loaf. Let rise for 15 minutes. If you intend to bake that day, preheat the oven to 450 degrees with the stone placed on a rack in the middle and place a shallow pan of water in the oven somewhere other than on the stone to provide humidity. The humidity helps the raising process during baking and improves the surface crust. After approximately 15 minutes of raising on the counter top, even if the dough hasn’t risen a great deal at this point, transfer the parchment paper and dough ball to the stone and bake until the loaf is a rich brown and thumps when you tap it. Remove from oven with mitts and cool on a rack before slicing. To store, wait until cooled then place in a plastic bag. In my experience, there rarely is anything left to store because it’s consumed as soon as removed from the oven. However, this would make a great gift for a fellow bread lover. You can purchase plastic bags made to use as food-containing gift bags. Check your local craft store. Just add a tag listing the ingredients and perhaps include the recipe and you have a home-made yummy gift nearly everyone would enjoy and appreciate. 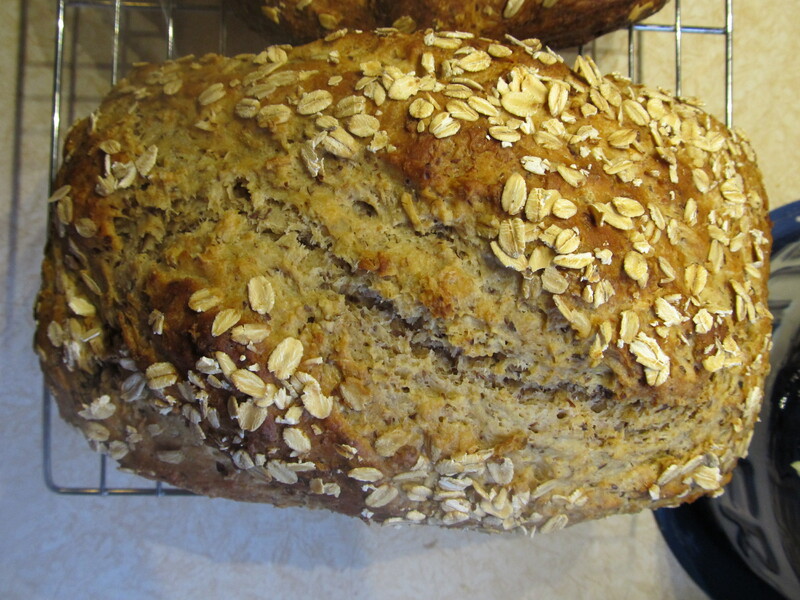 Oatmeal bread, made by my hands, and cooling on the rack. This loaf lasted about 5 minutes once I let the family at it! I hope these simple instructions have inspired you to give artisan bread making a try. I promise you won’t be disappointed. And Remember: If at once you don’t succeed, try, try again! This recipe is almost fool-proof if followed precisely, but I have been baking long enough to know that things don’t always turn out as expected…..they usually taste great no matter what they look like though. I wish you happy bread-baking, one of Life’s Simple Pleasures! 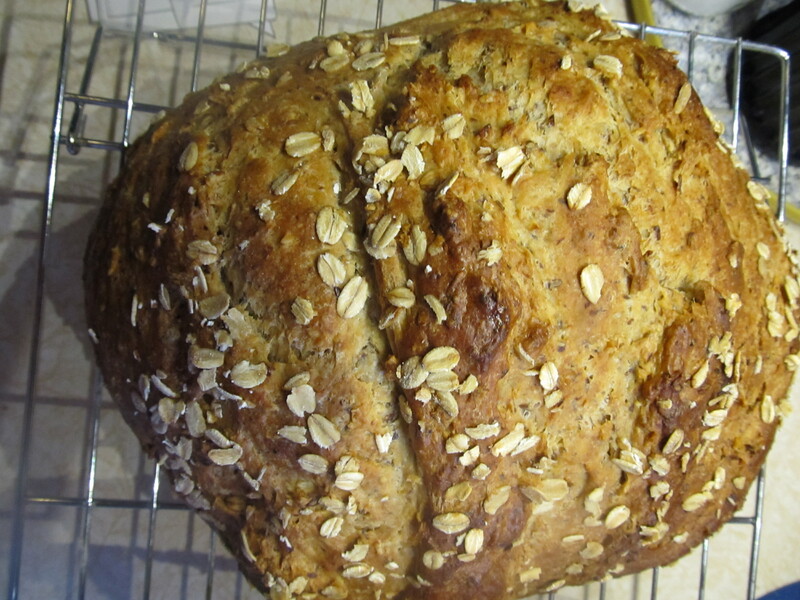 This entry was posted in DIY, gift ideas, Household, Recipe, Uncategorized and tagged artisan bread, bread stone, home made gift idea, home-made bread, oatmeal bread, quick & easy bread. Bookmark the permalink. 9 Responses to Artisan Bread Made Easy with No Kneading! Yum. You make it look so easy! I was very pleased to search out this net-site.I wished to thanks on your time for this excellent learn!! I positively enjoying each little little bit of it and I have you bookmarked to check out new stuff you weblog post. I’ll immediately take hold of your rss as I can not in finding your e-mail subscription link or e-newsletter service. Do you have any? Please allow me understand so that I may subscribe. Thanks. Hi there would you mind letting me know which webhost you’re working with? I’ve loaded your blog in 3 completely different browsers and I must say this blog loads a lot quicker then most. Can you suggest a good internet hosting provider at a reasonable price? Kudos, I appreciate it! Some really nice and utilitarian information on this site, besides I think the design has wonderful features. I was just looking for this information for a while. After six hours of continuous Googleing, at last I got it in your site. I wonder what is the lack of Google strategy that do not rank this type of informative websites in top of the list. Generally the top websites are full of garbage.